Indoors, the Kentia Palm does best in medium, indirect light such as in an east window. It will tolerate bright light, but the leaves may burn and it will be more susceptible to spider mites. It prefers well-drained, porous soil. Keep the soil moist at all times. Ideally, use a container with a sub-irrigation system. This plant rarely requires re-potting. It prefers to have its roots crowded in the pot. Keeping the plant in a smaller pot also restricts the growth. 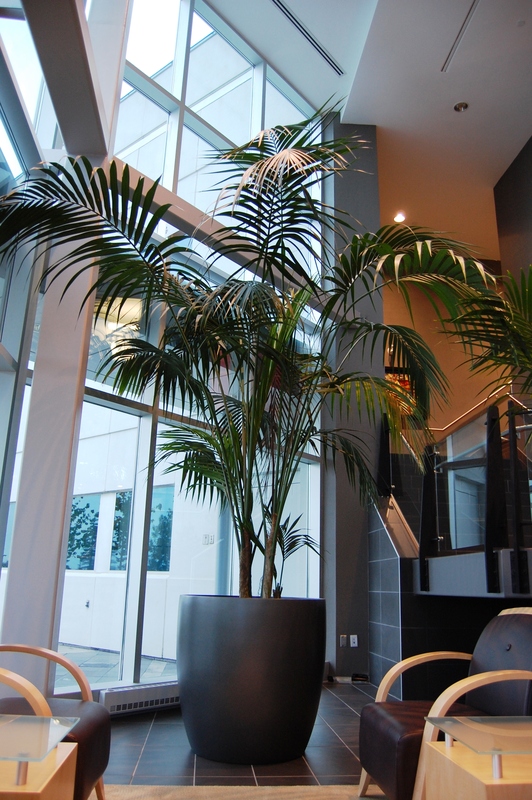 To show off this palm’s beautiful arching fronds, make sure it is placed in a large open area. Wipe the leaves regularly with a damp cloth to discourage spider mites. Regular fertilizing is important to keep the leaves green. Over fertilizing will result in yellow, weak leaves though, so follow the manufacturer’s recommendations carefully. Only fertilize monthly from February through to November. 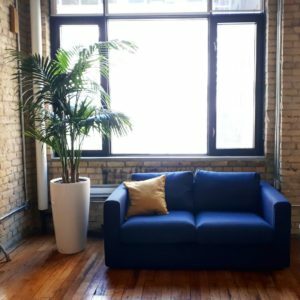 Simple elegant design in a Toronto office lounge.